Although bumblebees and honeybees are closely related, their strategies for surviving the winter are quite different. Despite maintaining a colony throughout the summer, it is the bumblebee queens alone that hibernate during the winter months. The last brood produced within the colony will contain a number of large queens that all go their separate ways after mating. During this period of life a reduced metabolism allows her to survive without eating, slowly burning her fuel reserves. As spring arrives, she will work hard to find a suitable nest and create a ‘honey pot’, made of beeswax to hold a small amount of honey. During the spring, a bumblebee queen will produce ‘bee bread’, A mix of pollen and honey. It is used as a bed for their eggs which she will incubate, sustaining herself on the contents of her honey pot as they develop. The first generation will be workers, able to take over the household duties of cleaning and foraging whilst she focuses on producing more eggs. Later in the year, the queen will produce other queens and reproductive male drones that will go on to create the next generation. Honeybees, such as the lovely new additions to our garden, busy themselves throughout the summer, collecting pollen and turning it into the honey that sustains the hive and spoils dedicated beekeepers. 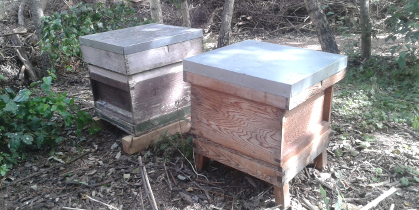 Although winter colonies are much smaller than summer colonies, only a few thousand individuals, beekeepers must take care when harvesting the honey not to remove stocks too late in the year. It is these stocks of honey that allow the colony within the hive to continue to thrive behind closed doors during the winter months. Studies have shown that during the winter honeybees can consume up to 30 pounds of honey! All of these sugars help the bees to produce the necessary body heat to stay active and warm. The bees will venture out in mild conditions to stretch their wings and pop to the loo, but as we can all appreciate, cosying down with friends and family can be the perfect solution to the winter blues!